West Ranch vs. Cajon, 3:30 p.m.
Notre Dame vs. St. Augustine, 5 p.m.
Price vs. Diamond Ranch, 6:30 p.m.
Leuzinger vs. Pasadena, 8 p.m.
Highland vs. Westlake, 3:30 p.m.
Oaks Christian vs. Muir, 5 p.m.
Cantwell-Sacred Heart vs. Palisades, 6:30 p.m.
Firebaugh vs. Maranatha, 8 p.m.
West Ranch/Cajon loser vs. Leuzinger/Pasadena loser, , 3:30 p.m.
Notre Dame/St. Augustine loser vs. Price/Diamond Ranch loser, 5 p.m.
Cantwell-Sacred Heart/Palisades loser vs. Highland/Westlake loser, 3:30 p.m.
Oaks Christian/Muir loser vs. Firebaugh/Maranatha loser, 5 p.m.
Notre Dame/St. Augustine winner vs. Price/Diamond Ranch winner, 6:30 p.m.
West Ranch/Cajon winner vs. Leuzinger/Pasadena winner, 8 p.m.
Cantwell-Sacred Heart/Palisades winner vs. Highland/Westlake winner, 6:30 p.m.
Oaks Christian/Muir winner vs. Firebaugh/Maranatha winner, 8 p.m.
Bosco too much for Amat: Bishop Amat knew its chances were slim and whatever other superlatives you want to use to describe its upset chances against St. John Bosco, ranked No. 1 in the country by several publications, including USA Today and MaxPreps, in Friday’s CIF-SS Pac-5 Division semifinal in front of an estimated 12,000 at Cerritos College. While Amat took eventual champion Corona Centennial to the final seconds a year ago before bowing out in the semifinals, it was never a factor against Bosco, which routed Amat 63-10 and forced a running clock in the fourth for the 12th time in 13 games. Charter Oaks rallies past Glendora: GLENDORA — Longtime Charter Oak High School football coach Lou Farrar has seen his teams come through a lot hairy situations through the years.So, for the five-time CIF Southern Section champion coach to admit he was nervous when Glendora took a two-score lead in the first half of Friday’s Central Division semifinals is really saying something.But fear not, Big Lou. The Chargers had an answer. A resounding one, and rattled off the next four scores to post a 28-14 win. Charter Oak improved 12-1 and will host San Marino (13-0) in next week’s championship game. Glendora finished 11-2.“(Glendora is) a really good football team and they were well-prepared,” Farrar said. “Hell yes, I was nervous. I think my wife may have been passed out up there (in the stands). We just had to eliminate some mistakes and get some breaks.”The win marked the second time Charter Oak topped Glendora this season. The Chargers won 28-7 on Sept. 25. But Glendora hadn’t lost since and looked well on its way to sweet revenge early. GRANADA HILLS >> For a full year, Sierra Canyon’s CIF Southern Section Mid-Valley Division semifinal loss to Pomona lingered over the team like a foul odor.When the chance for revenge came Friday at Granada Hills High in this year’s semifinals, the Trailblazers did not wait long to dish out what they had pent up so long.Eric Markes kick-started the fun with a 90-yard touchdown on a punt return in the first quarter and by the fourth, a running clock was established as Sierra Canyon won 62-26 to reach its first CIF final since 2011. Rowland 69, Fullerton 47 — Jonathan Hu had 20 points, five rebounds and five assists, Curtis Hong registered 24 points, five steals and three assists and Phillip Aguiniga added 13 points, 11 assists, six steals and five rebounds for the Raiders (1-0) in a nonleague win. Arroyo 56, Torres 51 — Justin Alfonso had 23 points, Francisco Martinez added 10 points and Fabian Gomez had 12 rebounds to lead the Knights (4-0) to the Lions Take of the Turkey Tournament win. Mendez 45, Edgewood 41 — Terrell Lewis had 14 points and Michael Martinez had 10 rebounds for the Lions (1-4) in a Lions Take of the Turkey Tournament loss. Glendora 68, Ramona 30 — Michelle Can had 17 points and Alexis Lowden added 13 points to lead the Tartans (2-1) to the South El Monte Tournament victory. El Rancho 56, Glendora 52 — Makayla Tilton had 17 points, Michelle Can added 14 points and Kayla Sera registered 10 points for the Tartans (1-1) in a South El Monte Tournament loss. PrepXtra Live Semifinal Football Preview Show …. 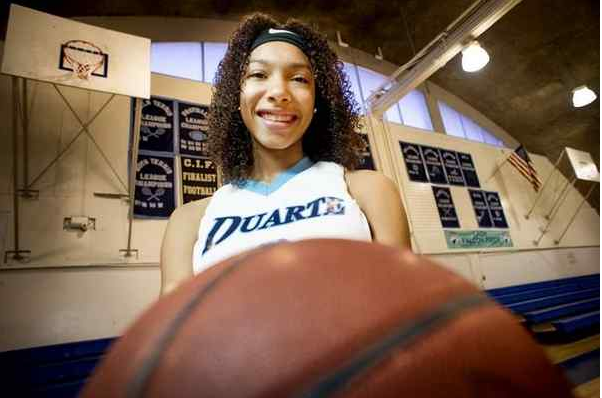 The Duarte High School girls basketball program has been no stranger to success. The Falcons have had four 20-plus winning seasons in the last four years and have been to the CIF Southern Section playoffs every year since 2010. They went to the CIF State tournament in 2010 and reached the quarterfinals of the CIF-SS divisional playoffs last year. But the Falcons appear to have stepped up their game. They have hired Scott Wiard as head coach. Scott helped his father, Richard, to two CIF State and five CIF-SS titles at Bishop Amat. The Wiards, with Richard as an assistant coach, will find the cupboards are not bare. The Falcons have two of the best players in the west San Gabriel Valley, which is why they earned the preseason No. 1 position. Six-foot-seven sophomore Patricia Morris is back, along with a top point guard and a top scorer. Morris averaged 9.2 points and nine rebounds on a team that went 20-9 last year. And then there is senior Mackenzie Barnes, who led the Falcons in scoring last year playing point guard. “I think in girls basketball if you have a really good point guard and a big girl in the middle, you’ll be pretty decent,” Wiard said. “We’re pretty blessed because we are fortunate to have both. Then there’s junior Ryley Thompson, one of the top 3-point shooters in the valley. Seniors Karmeece Robinson and Sofia Calvo also return. Freshman Delanye Thompson, Ryley’s sister, is expected to see playing time off he bench. 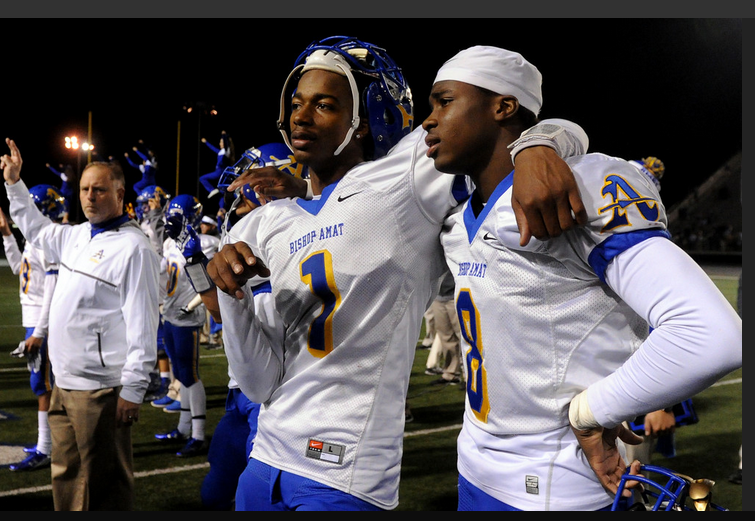 I don't care what St. John Bosco's done, I like Bishop Amat's chances next week. They can match anyone score for score. It's on. This simple Tweet went viral late Friday with a lot of folks thinking I lost my mind for thinking Amat could be on the same field with St. John Bosco. I stand by what I wrote, that I like their chances, and what I mean by that is I like their chances for a mammoth upset. But am I ready to predict it? No. Nobody in their right mind would pick Amat if you were asked to bet the mortgage on it. But I don’t think it’s impossible and I do believe it will be a winnable game in the fourth quarter. I was wavering on Charter Oak and Glendora before finally settling on Charter Oak. I watched the first game and Charter Oak handled Glendora up front. That’s going to be the difference again. But it will be closer than 28-7 the second time around. I love San Dimas’ chances against Viewpoint after watching how close Covina came to beating them. I picked San Dimas to upset Paraclete and get to the finals and not changing my mind now. I also like Sierra Canyon to beat Pomona in a not-so-close game. In other out of area games, take St. Francis in an upset over No. 1 La Serna and go with La Mirada to reach the finals over Cathedral. I also have La Habra all day over Villa Park. 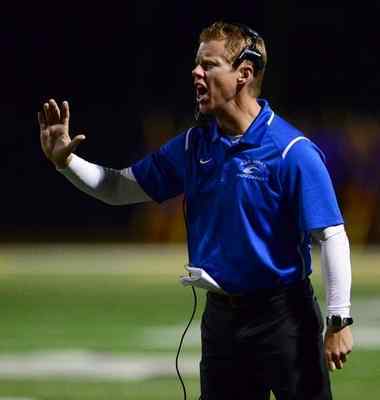 HOLMAN DELIVERING IN FIRST SEASON: Raise your hand if you picked the San Dimas High School football team to reach the semifinals or beyond of the Mid-Valley Division playoffs. Besides Saints fans, very few football fans around the Valley had San Dimas surviving its second-round trip to No. 2 seed Paraclete. But that’s exactly what happened.San Dimas scored arguably the most impressive victory of any Valley team last Friday when it toppled Paraclete, 43-28, at Antelope Valley College. “My guys, they wanted Paraclete,” first-year San Dimas head coach Mark Holman said. “We were just really focused. We’ve been getting better every week since the Northview loss. We are built for this kind of football.”Now, the path is clear for San Dimas to reach the championship game. Despite being on the road in Friday’s semifinals, San Dimas (9-3) is favored by most to beat Viewpoint (7-5).